ComBear is an EXTREMELY powerful and incredibly dynamic Parallel Compression effect plugin that brings an amazing sound and feel to Drums, Synth, Vocals and anything else you can thank of! This plugin is going to change the game and sound the EDM Industry. 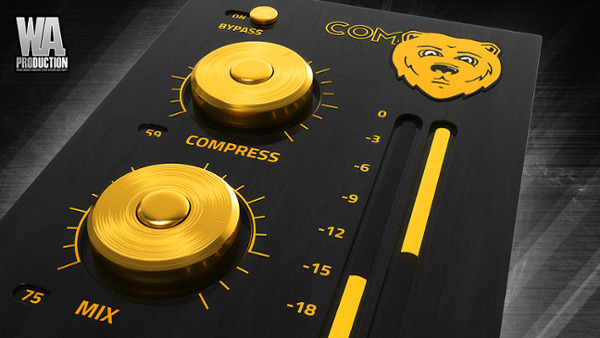 ComBear is packed full with incredible features like; Compress, Mix, Input Gain, Make-Up Gain and Bypass. By adjusting the Compress knob, you increase the Parallel Compression that ComBear adds the the element from value 0 to 100, Bypass ComBear’s effects on an element by flipping the Bypass switch, correct the Make-Up Gain that is altered based on how much Compress you add the the element by adjusting the Make-Up Gain, adjust how much gain comes in from the element by adjusting the Input Gain and finally adjust how much of ComBear you hear on the element with the Mix knob. The Idea behind this plugin was of course Parallel Compression. The main way ComBear can be used is add the plugin to a certain element then have the ability to compress that element pretty hard, and then mix this harshly compressed element with a duplicate of the element that is not compressed. This tactic brings a bold, delightful and intense sound to any and all elements of the production. ComBear is a must have tool in the production world, and is something any and all producers should look into investing in. In the simplest way, Parallel Compression, also called New York Compression, is a very dynamic range compression technique that is used in sound recording and mixing. Basically, Parallel Compression is a big form of upward compression and is achieved by mixing an unprocessed “dry”, or lightly compressed signal with a heavily compressed version of the same signal. The Compress knob is what will add the Parallel Compression to the element from the value 0 to 100.